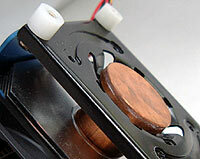 Abstract: The heatsink looks fairly unremarkable from the outside, but at the center sits a 25mm diameter copper heatpipe which gives the NPH-1 some really serious kick. Thermal Transtech International Corporation (TTIC) are the company behind the 'nPowertek' brand of heatsinks, and while many of you probably haven't ever heard of nPowertek, or the NPH-1 Pentium 4 heatsink we are examining, you may just want to stand up and take notice. The large blue heatsink looks fairly unremarkable from the outside, but at the center sits a 25mm diameter heatpipe which gives the NPH-1 some really serious kick. The large copper heatpipe stands 100mm tall, and comes in direct contact with the processor core for optimal effectiveness. TTIC have termed the heart of the NPH-1 a "heat column," even though it is just a very large heatpipe based on a sintered metal wick. As you know, heat pipes work by moving heat energy from one location to another, and so for the NPH-1 to work as a heatsink that thermal energy must be disposed of. Hidden behind the beefy blue aluminum shroud are 30 aluminium fins measuring roughly 70x80mm in size. The 25mm diameter heat pipe passes up through the center of each of the 0.5mm thick aluminum fins, transferring the heat energy to them in the process. 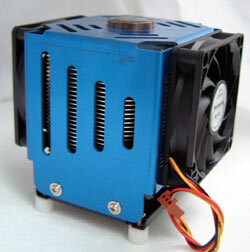 Two 70mm fans, one on either side of the heatpipe and aluminum fin assembly provide the necessary airflow to exhaust that heat from the fins to the surrounding environment, and consequently keep the processor from overheating. The system worked so well in fact that we had to test the nPowertek NPH-1 twice just to be sure everything was working properly! 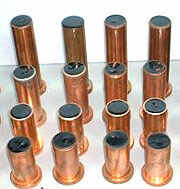 The TTIC "Heat Column" used at the center of the NPH-1 is 25mm in diameter, and 100mm tall. The company illustrates the various diameters and heights of 'heat columns' they offer, giving a better illustration of how the heat pipes are constructed. Heatpipes themselves are really interesting little devices; as heat energy from the processor reaches the heatpipe a reaction inside the copper tube begins to occur. The copper cylinder is hollow, and sealed at both ends, but there is a small amount of liquid inside, under a vacuum. The 'working fluid' as it's called, absorbs the latent heat which causes it to boil and undergo a phase change into water vapour. In our daily lives, water boils at 100C, but as pressure is decreased the temperature gradient required to cause water to boil also drops. In any case, the small amount of water inside easily converts to water vapour as the temperature of the evaporator end of the heatpipe increases. The vapour is subsequently drawn to the cooler end of the heatpipe, and since that side is cooler, it condenses. As the hot vapour cools back into liquid, the heat energy that it previously stored is transferred to the surrounding apparatus (the heatpipe wall, and the fins which are in contact on the outside) on the condensation end of the heatpipe. The condensed vapour, now working fluid once again, is drawn back to the hot evaporator end of the heatpipe by capillary action along an internal sintered metal wick structure which is porous. As the liquid reaches the hot end once more, the entire process repeats. Heatpipes are a closed loop process that work within certain temperature ranges, for example 30C - 80C degrees. If the differential between the hot and cool sides becomes too low (say for example, each side reaches 85 degrees) the system can stall. Of course, with two fans to keep the heatpipes' condenser end in the clear this isn't a likely situation for the NPH-1.